SPRING SPORTS 2018: PAGE 5 PRESS & DAKOTAN ? 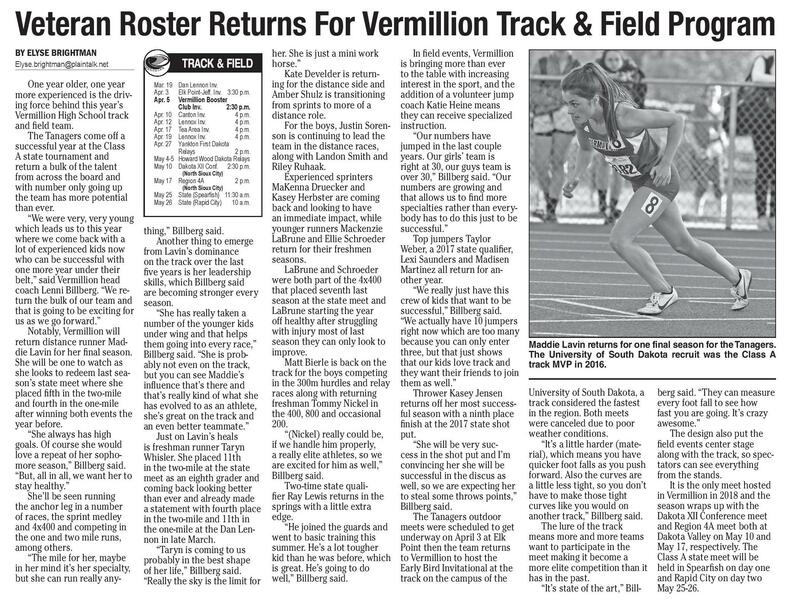 PLAIN TALK Veteran Roster Returns For Vermillion Track & Field Program BY ELYSE BRIGHTMAN TRACK & FIELD Elyse.brightman@plaintalk.net One year older, one year more experienced is the driving force behind this year’s Vermillion High School track and field team. The Tanagers come off a successful year at the Class A state tournament and return a bulk of the talent from across the board and with number only going up the team has more potential than ever. “We were very, very young which leads us to this year where we come back with a lot of experienced kids now who can be successful with one more year under their belt,” said Vermillion head coach Lenni Billberg. “We return the bulk of our team and that is going to be exciting for us as we go forward.” Notably, Vermillion will return distance runner Maddie Lavin for her final season. She will be one to watch as she looks to redeem last season’s state meet where she placed fifth in the two-mile and fourth in the one-mile after winning both events the year before. “She always has high goals. Of course she would love a repeat of her sophomore season,” Billberg said. “But, all in all, we want her to stay healthy.” She’ll be seen running the anchor leg in a number of races, the sprint medley and 4x400 and competing in the one and two mile runs, among others. “The mile for her, maybe in her mind it’s her specialty, but she can run really any- Mar. 19 Dan Lennon Inv. Apr. 3 Elk Point-Jeff. Inv. 3:30 p.m. Apr. 5 Vermillion Booster Club Inv. 2:30 p.m. Apr. 10 Canton Inv. 4 p.m. Apr. 12 Lennox Inv. 4 p.m. Apr. 17 Tea Area Inv. 4 p.m. Apr. 19 Lennox Inv. 4 p.m. Apr. 27 Yankton First Dakota Relays 2 p.m. May 4-5 Howard Wood Dakota Relays May 10 Dakota XII Conf. 2:30 p.m. (North Sioux City) May 17 Region 4A (North Sioux City) 2 p.m. May 25 State (Spear?sh) 11:30 a.m. May 26 State (Rapid City) 10 a.m. thing,” Billberg said. Another thing to emerge from Lavin’s dominance on the track over the last five years is her leadership skills, which Billberg said are becoming stronger every season. “She has really taken a number of the younger kids under wing and that helps them going into every race,” Billberg said. “She is probably not even on the track, but you can see Maddie’s influence that’s there and that’s really kind of what she has evolved to as an athlete, she’s great on the track and an even better teammate.” Just on Lavin’s heals is freshman runner Taryn Whisler. She placed 11th in the two-mile at the state meet as an eighth grader and coming back looking better than ever and already made a statement with fourth place in the two-mile and 11th in the one-mile at the Dan Lennon in late March. “Taryn is coming to us probably in the best shape of her life,” Billberg said. “Really the sky is the limit for her. She is just a mini work horse.” Kate Develder is returning for the distance side and Amber Shulz is transitioning from sprints to more of a distance role. For the boys, Justin Sorenson is continuing to lead the team in the distance races, along with Landon Smith and Riley Ruhaak. Experienced sprinters MaKenna Druecker and Kasey Herbster are coming back and looking to have an immediate impact, while younger runners Mackenzie LaBrune and Ellie Schroeder return for their freshmen seasons. LaBrune and Schroeder were both part of the 4x400 that placed seventh last season at the state meet and LaBrune starting the year off healthy after struggling with injury most of last season they can only look to improve. Matt Bierle is back on the track for the boys competing in the 300m hurdles and relay races along with returning freshman Tommy Nickel in the 400, 800 and occasional 200. “(Nickel) really could be, if we handle him properly, a really elite athletes, so we are excited for him as well,” Billberg said. Two-time state qualifier Ray Lewis returns in the springs with a little extra edge. “He joined the guards and went to basic training this summer. He’s a lot tougher kid than he was before, which is great. He’s going to do well,” Billberg said. 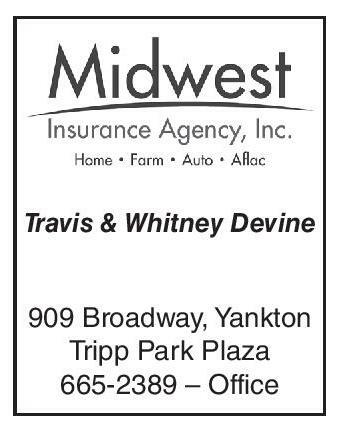 New-Look Tanagers Take The Diamond BY ELYSE BRIGHTMAN BASEBALL | PAGE 6 VHS Golf FROM PAGE 4 identical scores of 93 and 90 for a 183 total and a tie for 19th place to help the team finish third overall. “We got third in the state with a team that I thought was still rebuilding year,” Hogan said. “That’s why it will be interesting to see how the preseason here will pan out. If we can get a few more back out then we definitely have the potential to go up there and do something.” The players are just looking to get on the range before the first match of the season on April 10, but the colder than average weather Senior Riley Johnson is the Tanager baseball squad. 3/26 4/3 4/10 4/12 4/19 4/24 5/1 5/4-5 5/5 5/8 Lounsbery Early Bird ccd. Scotland Inv. 2 p.m. Rotary Relays (Centerville) 1 p.m. Menno Relays 9 a.m. Flyer Inv. (Freeman) 1 p.m. Great Plains Conf. (Burke) 11 a.m. Don Diede Relays (Freeman) 1 p.m. Howard Wood Dakota Relays Parker Inv. 9 a.m. Tri-Valley Conf. (Gayville) 1 p.m. University of South Dakota, a track considered the fastest in the region. Both meets were canceled due to poor weather conditions. “It’s a little harder (material), which means you have quicker foot falls as you push forward. Also the curves are a little less tight, so you don’t have to make those tight curves like you would on another track,” Billberg said. The lure of the track means more and more teams want to participate in the meet making it become a more elite competition than it has in the past. “It’s state of the art,” Bill- berg said. “They can measure every foot fall to see how fast you are going. It’s crazy awesome.” The design also put the field events center stage along with the track, so spectators can see everything from the stands. It is the only meet hosted in Vermillion in 2018 and the season wraps up with the Dakota XII Conference meet and Region 4A meet both at Dakota Valley on May 10 and May 17, respectively. The Class A state meet will be held in Spearfish on day one and Rapid City on day two May 25-26. Tennis: Young VHS Squad Looks To Surprise Foes ELYSE BRIGHTMAN Just because the Vermillion High School boys’ tennis team doesn’t have any seniors on the roster doesn’t mean they aren’t expecting to surprise a few opponents this season. The team is a little shorthanded with only five players coming out this year, but the talent packs a punch. “Overall I just feel like, although it is a building year, I have a very strong team,” said head coach Brock Fehr. This year’s number one singles player is a newcomer to the team. Emile Khan, a junior, as not played for VHS, but competed previously while living in Germany. “Emile supposed has just been playing tennis his entire life and finally this year he decided he was going to do it,” Fehr said. He is a technical player with a lot of potential once he gets back into the swing of things. “So far I feel like he hasn’t played in so long that he has to get back into it,” Fehr lone returning starter for the added. In the number two spot will be Liam Mechling, a sophomore who is moving up from the number four spot where he competed last year. “Since last year he has gotten leaps and bounds better,” Fehr said. “Last year field to the senior leader. he was just your average Johnson’s time on the high school tennis player and varsity squad started his this year he has just come freshman year when he was invited to play up from junior very far and I would not be varsity during the state tour- surprised if he is able to win nament in 2015 and has been a few matches at state this year.” a main-stay on the diamond Rounding out the top since his sophomore year. 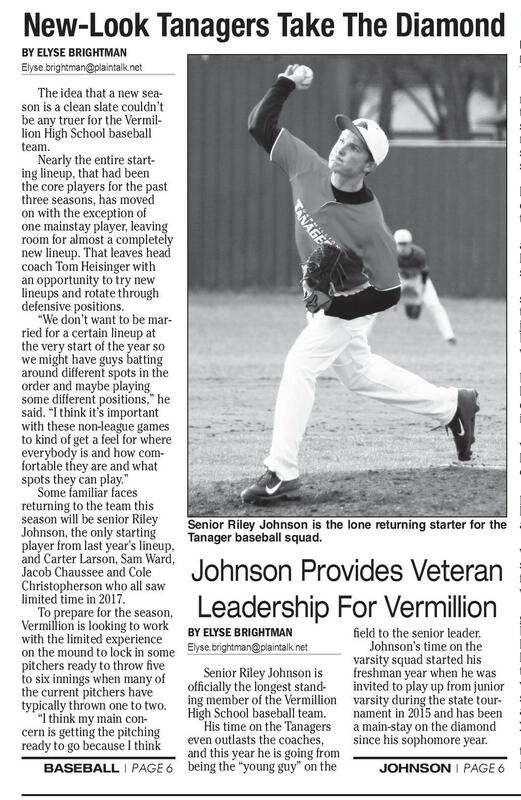 three is Nic Harris, another JOHNSON | PAGE 6 returning player who worked Johnson Provides Veteran Leadership For Vermillion BY ELYSE BRIGHTMAN Elyse.brightman@plaintalk.net Senior Riley Johnson is officially the longest standing member of the Vermillion High School baseball team. His time on the Tanagers even outlasts the coaches, and this year he is going from being the “young guy” on the the other teams in the region stand. “You can prepare yourself Apr. 10 vs. Madison 2 p.m. for the course you are going Apr. 12 vs. Canton 4 p.m. to play, but everyone has Apr. 19 Elk Point-Jeff. Inv. 9 a.m. got to play the same weather Apr. 24 Dakota Valley Inv. 9 a.m. Apr. 27 at Dakota Valley 4 p.m. conditions,” Hogan said. May 1 Dell Rapids Inv. 9 a.m. “I’m going to prepare my May 7 West Central Inv. 9 a.m. kids more with their golf and May 10 vs. Dakota Valley 4 p.m. May 14 Vermillion Inv. 9 a.m. their mental state and getting May 21 Dakota XII Conf. 9 a.m. ready for that golf course, (Dell Rapids) May 30 Region 2A (Hartford) 9 a.m. but there’s not much you can June 4-5 State Tourn. (Dell Rapids) do with what the other kid is going to shoot.” Vermillion hosts its first has been hindering practice two matches on the season times. “Right now we are just try- with Madison on April 10 ing to get out. The range just and Canton on April 12 then travel to the Elk Point-Jefferfinally got opened back up, so we are going to practice a son Invite on April 19. The Dakota XII Conference meet is little bit,” Hogan said. 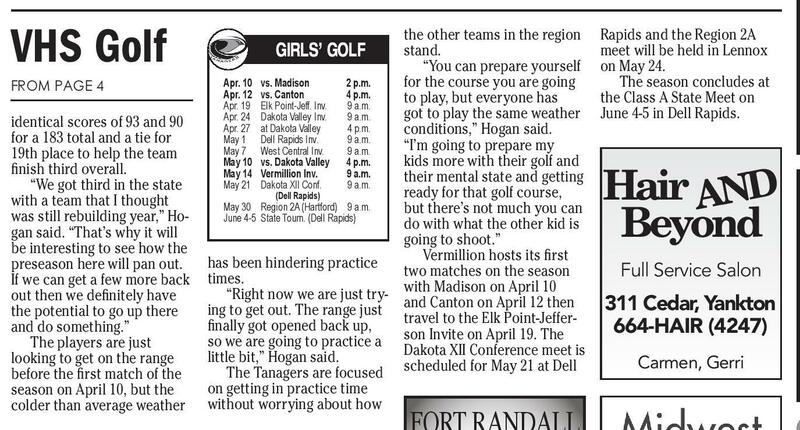 The Tanagers are focused scheduled for May 21 at Dell on getting in practice time without worrying about how GIRLS’ GOLF 4/12 Boys’ & Girls’ Golf Southeast S.D. 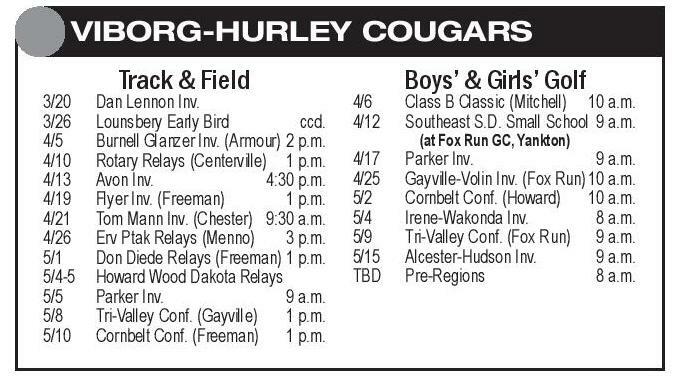 Small School 9 a.m. (at Fox Run GC, Yankton) 4/17 4/25 5/1 5/4 5/9 5/11 Parker Inv. 9 a.m. Gayville-Volin Inv. (Fox Run) 10 a.m. Baltic Inv. (Renner) 9 a.m. Irene-Wakonda Inv. 8 a.m. Tri-Valley Conf. (Fox Run) 9 a.m. Bridgewater-Emery Inv. 10 a.m. 5/15 TBD Alcester-Hudson Inv. 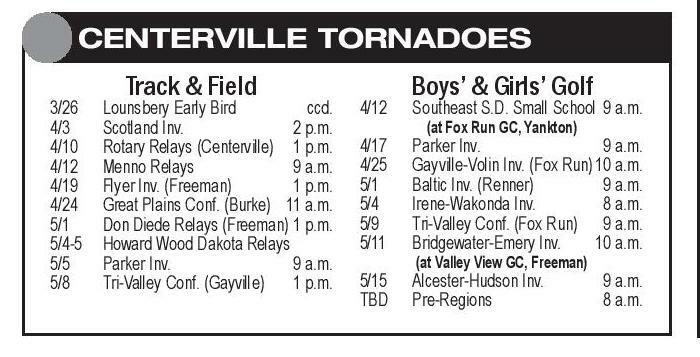 Pre-Regions (at Valley View GC, Freeman) Rapids and the Region 2A meet will be held in Lennox on May 24. The season concludes at the Class A State Meet on June 4-5 in Dell Rapids. 9 a.m. 8 a.m. 605-563-2863 Viborg, SD Nic Harris returns a shot during the Tanagers’ seasonopening triangular at Yankton on March 27. hard in the offseason and took lessons during the summer. Harris is another returning sophomore, but Fehr says his abilities are now ahead of last year’s seniors. Overall, the team is working on basic skills and will continue to advance in skill work as the season progresses toward the state tournament. The Tanagers opened the season with a triangular at Yankton with Sioux City. The team lost both matches, but saw some promising individual scores. “They stood in there and didn’t lay down or give up or anything,” Fehr said. The season continued on April 5 at Luverne, Minnesota then on to Harrisburg on April 9 and Brandon Valley April 10. The Tanagers play the first home match on April 17 with the Vermillion Invite. 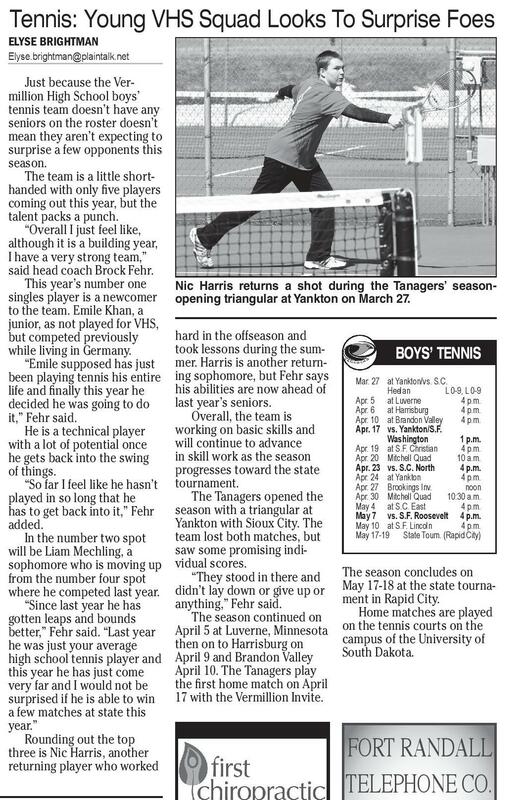 BOYS’ TENNIS Mar. 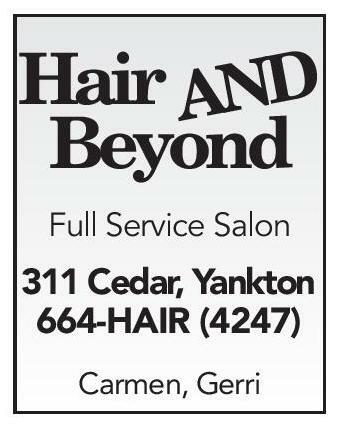 27 at Yankton/vs. S.C. Heelan L 0-9, L 0-9 Apr. 5 at Luverne 4 p.m. Apr. 6 at Harrisburg 4 p.m. Apr. 10 at Brandon Valley 4 p.m. Apr. 17 vs. Yankton/S.F. Washington 1 p.m. Apr. 19 at S.F. Christian 4 p.m. Apr. 20 Mitchell Quad 10 a.m. Apr. 23 vs. S.C. North 4 p.m. Apr. 24 at Yankton 4 p.m. Apr. 27 Brookings Inv. noon Apr. 30 Mitchell Quad 10:30 a.m. May 4 at S.C. East 4 p.m. May 7 vs. S.F. Roosevelt 4 p.m. May 10 at S.F. Lincoln 4 p.m. May 17-19 State Tourn. (Rapid City) The season concludes on May 17-18 at the state tournament in Rapid City. Home matches are played on the tennis courts on the campus of the University of South Dakota. 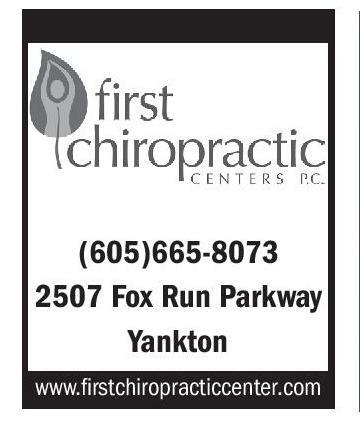 FORT RANDALL TELEPHONE CO. (605)665-8073 2507 Fox Run Parkway Yankton 605-563-2863 Centerville, SD www.firstchiropracticcenter.com Hair AND Beyond Championship healthCare is always in season. Proudly serving our communities with medical team you can trust! 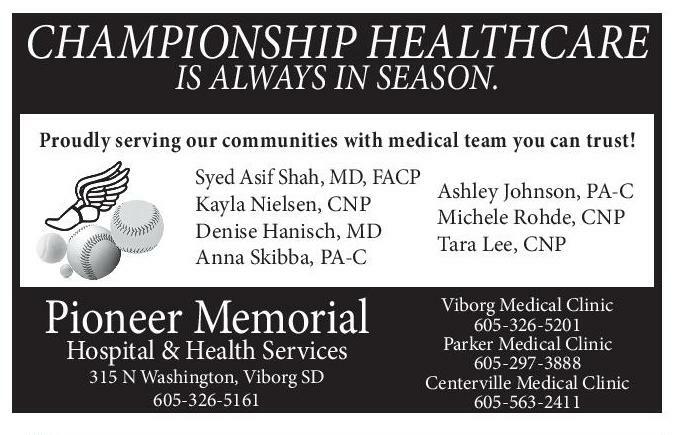 Syed Asif Shah, MD, FACP Ashley Johnson, PA-C Kayla Nielsen, CNP Michele Rohde, CNP Denise Hanisch, MD Tara Lee, CNP Anna Skibba, PA-C Full Service Salon 311 Cedar, Yankton 664-HAIR (4247) Carmen, Gerri Pioneer Memorial Hospital & Health Services 315 N Washington, Viborg SD 605-326-5161 FORT RANDALL TELEPHONE CO. CENTERVILLE TORNADOES Track & Field Maddie Lavin returns for one final season for the Tanagers. The University of South Dakota recruit was the Class A track MVP in 2016. Elyse.brightman@plaintalk.net Elyse.brightman@plaintalk.net The idea that a new season is a clean slate couldn’t be any truer for the Vermillion High School baseball team. Nearly the entire starting lineup, that had been the core players for the past three seasons, has moved on with the exception of one mainstay player, leaving room for almost a completely new lineup. That leaves head coach Tom Heisinger with an opportunity to try new lineups and rotate through defensive positions. “We don’t want to be married for a certain lineup at the very start of the year so we might have guys batting around different spots in the order and maybe playing some different positions,” he said. “I think it’s important with these non-league games to kind of get a feel for where everybody is and how comfortable they are and what spots they can play.” Some familiar faces returning to the team this season will be senior Riley Johnson, the only starting player from last year’s lineup, and Carter Larson, Sam Ward, Jacob Chaussee and Cole Christopherson who all saw limited time in 2017. To prepare for the season, Vermillion is looking to work with the limited experience on the mound to lock in some pitchers ready to throw five to six innings when many of the current pitchers have typically thrown one to two. “I think my main concern is getting the pitching ready to go because I think In field events, Vermillion is bringing more than ever to the table with increasing interest in the sport, and the addition of a volunteer jump coach Katie Heine means they can receive specialized instruction. “Our numbers have jumped in the last couple years. Our girls’ team is right at 30, our guys team is over 30,” Billberg said. “Our numbers are growing and that allows us to find more specialties rather than everybody has to do this just to be successful.” Top jumpers Taylor Weber, a 2017 state qualifier, Lexi Saunders and Madisen Martinez all return for another year. “We really just have this crew of kids that want to be successful,” Billberg said. “We actually have 10 jumpers right now which are too many because you can only enter three, but that just shows that our kids love track and they want their friends to join them as well.” Thrower Kasey Jensen returns off her most successful season with a ninth place finish at the 2017 state shot put. “She will be very success in the shot put and I’m convincing her she will be successful in the discus as well, so we are expecting her to steal some throws points,” Billberg said. The Tanagers outdoor meets were scheduled to get underway on April 3 at Elk Point then the team returns to Vermillion to host the Early Bird Invitational at the track on the campus of the Viborg Medical Clinic 605-326-5201 Parker Medical Clinic 605-297-3888 Centerville Medical Clinic 605-563-2411 VIBORG-HURLEY COUGARS Travis & Whitney Devine 909 Broadway, Yankton Tripp Park Plaza 665-2389 – Office 3/20 3/26 4/5 4/10 4/13 4/19 4/21 4/26 5/1 5/4-5 5/5 5/8 5/10 Track & Field Dan Lennon Inv. Lounsbery Early Bird ccd. Burnell Glanzer Inv. (Armour) 2 p.m. Rotary Relays (Centerville) 1 p.m. Avon Inv. 4:30 p.m. Flyer Inv. (Freeman) 1 p.m. Tom Mann Inv. (Chester) 9:30 a.m. Erv Ptak Relays (Menno) 3 p.m. Don Diede Relays (Freeman) 1 p.m. Howard Wood Dakota Relays Parker Inv. 9 a.m. Tri-Valley Conf. 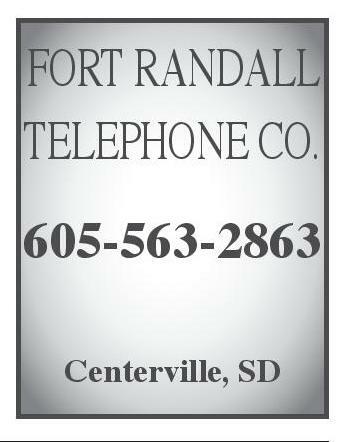 (Gayville) 1 p.m. Cornbelt Conf. (Freeman) 1 p.m. 4/6 4/12 4/17 4/25 5/2 5/4 5/9 5/15 TBD Boys’ & Girls’ Golf Class B Classic (Mitchell) 10 a.m. Southeast S.D. Small School 9 a.m. (at Fox Run GC, Yankton) Parker Inv. 9 a.m. Gayville-Volin Inv. 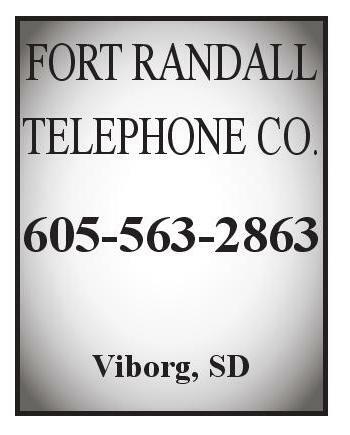 (Fox Run) 10 a.m. Cornbelt Conf. (Howard) 10 a.m. Irene-Wakonda Inv. 8 a.m. Tri-Valley Conf. (Fox Run) 9 a.m. Alcester-Hudson Inv. 9 a.m. Pre-Regions 8 a.m.